Hartwig, Melinda K. A Companion to Ancient Egyptian Art. 2015. 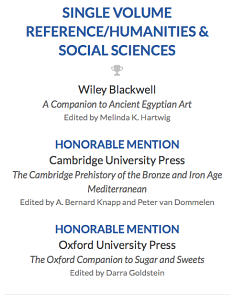 Congratulations to the Michael C. Carlos Museum curator, Melinda Hartwig, whose 2015 reference title, A Companion to Ancient Egyptian Art, won the PROSE award in the category of Single Volume Reference/Humanities & Social Science. 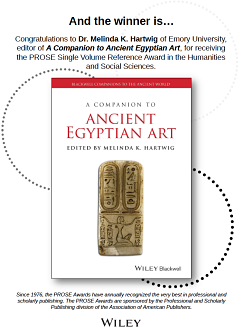 A Companion to Ancient Egyptian Art is a first-of-a-kind reference work that explores key concepts, critical discourses, and theories in the art of ancient Egypt and its interconnections. Unique among reference works, the Companion is organized thematically in order to highlight the methodological, material, socio-cultural, and technological debates in art. Further, the chapter length in the Companion allows contributors to explore the breadth and depth of their subjects. Written by international experts in the field, authors examine established and widely accepted art methodologies, but also offer new avenues for productive future approaches. Where opinions differ between authors, the reader finds critical points of debate that can stimulate dialogues about art, both in and out of the classroom. No volume like A Companion to Ancient Egyptian Art exists in the field of ancient art history. 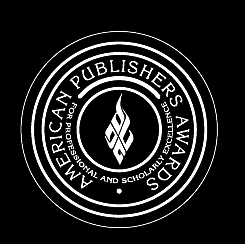 The unprecedented breadth of coverage and impeccable scholarship by leading scholars in the field makes this book an indispensible reference resource for scholars and students of the ancient world as well as general readers. Ancient Egyptian art stands at the threshold of a new era of scholarship. In this vein, Companion offers the first and only comprehensive synthesis of the issues that shape ancient Egyptian art history. This volume sheds light on Egyptian art and its interconnections by using the tools that archaeologists, linguists, scientists and art historians wield today. In short, the essays in the Companion comprise the current dialogue that will define the field of ancient Egyptian art history for decades to come. Emory’s discoverE record: Hartwig, Melinda K. A Companion to Ancient Egyptian Art. 2015.